Here we are - the entire World's Window staff as we were ready to party and raise money for Rose Brooks. What a fun evening we had at our 10th annual shopping benefit. And together we raised over $5,000!! It's Flipping Favorites Fiesta Time!! Read more about It's Flipping Favorites Fiesta Time!! Last Week to Make Clothing Donations for "Flipping Favorites"
Have you brought in your clothing donations? At World's Window we're counting down the last days of our 10th annual gently used clothing drive for Rose Brooks Center, providing emergency shelter and support to women and children escaping life-threatening abuse. Your generous donations will give you a Golden Ticket to our "Fabulous Flipping Favorites Fiesta" grand finale party on May 7, 2015, when you can shop our store at 20% off and shop the hundreds of donated items at just $10 per hangar. Read more about Last Week to Make Clothing Donations for "Flipping Favorites"
Are you as ready to spring clean your closets as we are? At World's Window we're getting ready to start our 10th annual gently used clothing drive for Rose Brooks Center, providing emergency shelter and support to women and children escaping life-threatening abuse. 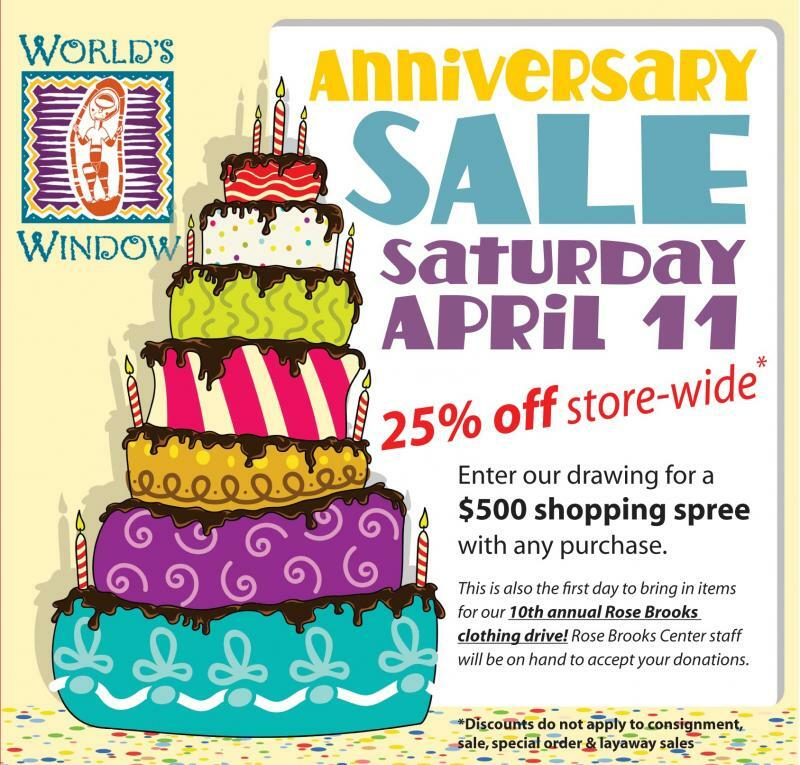 Come celebrate on Saturday, April 11, 2015 with store-wide savings of 25% off, anniversary cake and the start of our "Flipping Favorites" annual clothing drive for Rose Brooks Center. Choose new spring outfits, home decor, Mother's Day or wedding gifts at this anniversary celebration. Depending on your translation, February 19 marks the first day of the Year of the Sheep - or Goat - or Ram. What can we be happy about and look forward to? In the 12-animal Chinese Zodiac, the Sheep is kind, tender and sympathetic. Sheep are creative and elegant. Because of their softer side, they are symbolic of peace and harmony. The Year of the Sheep follows a tumultuous Year of the Horse, and heralds a year with a much more calm atmosphere. Hooray!